Are you looking for a steady job or even part-time work in 2018? Why not look online? This list of best freelance websites offers up the jobs that aim to hire freelancers. Whether you’re an expert in marketing, writing, design, or you’re a developer or coder, this list is your top source. 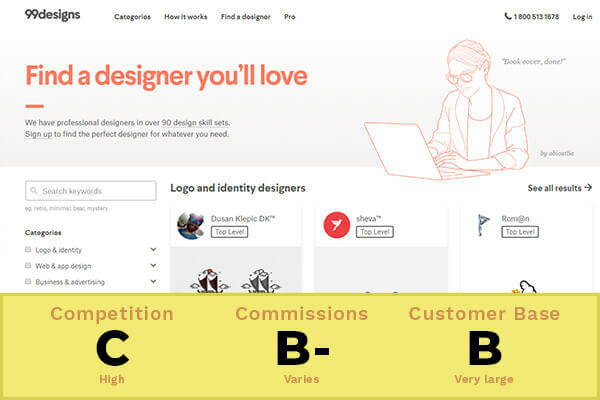 We’ve taken the 5 best freelance websites online and graded each of them based on competition, commissions, and customers. Competition: how many people are on the site vying for freelance gigs? Lower is better. Commissions: how much is the website taking out of freelancer payments? Lower is better. Customer Base: how many buyers are visiting the site each month? Higher is better. Freelancers sought: business consulting, product photography, copywriting, graphic design, digital marketing, video & animation. 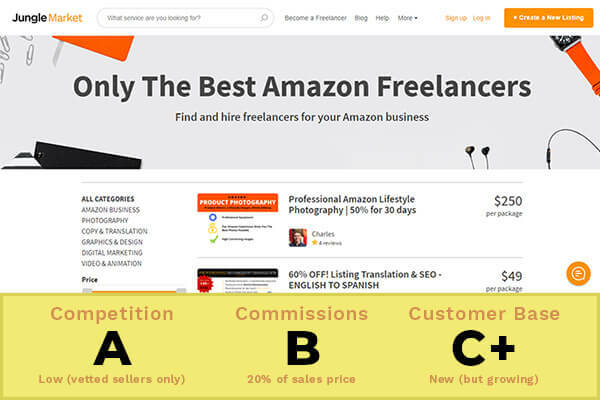 Jungle Scout Market offers a peer-to-peer channel for Amazon sellers to hire top freelancers to assist Amazon FBA sellers with their online businesses. Even if you’re not completely familiar with the Amazon FBA selling process, you should find yourself at ease here. Jungle Scout Market is relatively new to the scene, so competition is still low. However, its online traffic comes from the parent company Jungle Scout. Jungle Scout gets 2.5 million visitors per month, mostly Amazon sellers, therefore the freelancers already offering their services on Jungle Scout Market have stayed very busy. Freelancers sought: graphics & design, digital marketing, writing & translation, video & animation, music & audio, programming & tech, business, fun & lifestyle. Fiverr is probably one of the most well-known best freelancer websites on the web. Originally a source for finding low cost logos and design work, Fiverr has since ballooned into a massive freelancer site with plenty of opportunities for hard working freelancers. 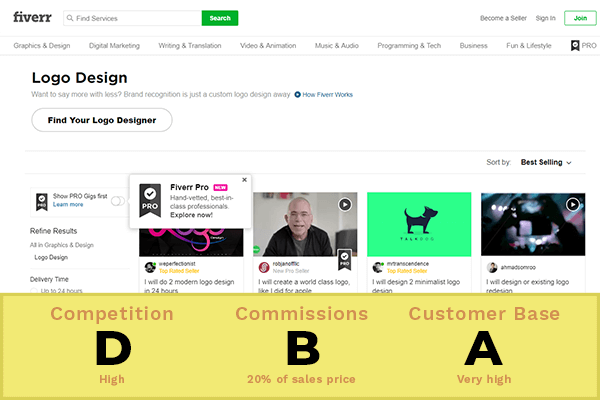 What makes Fiverr different than Upwork or the other sites is that Fiverr is a great source for finding quick, simple work at a relatively low price such as logos, 500 word blog posts, or short white board videos. The only downside to Fiverr is that it’s an extremely competitive work environment. And freelancers just starting out looking for online work might find themselves climbing an uphill battle. Freelancers sought: web developers, mobile developers, designers & creatives, writers, virtual assistants, customer service agents, sales & marketing experts, accountants & consultants. 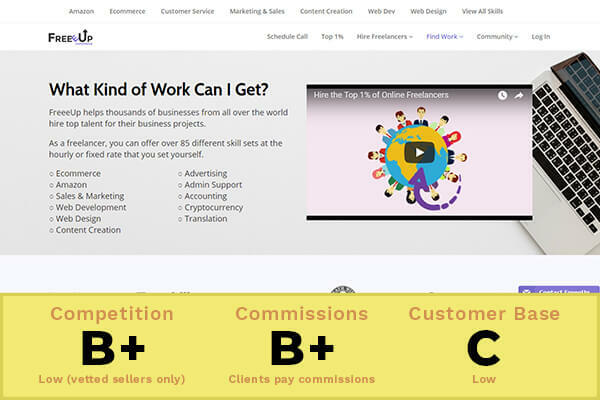 Upwork is another one of the massive best freelancer websites online. 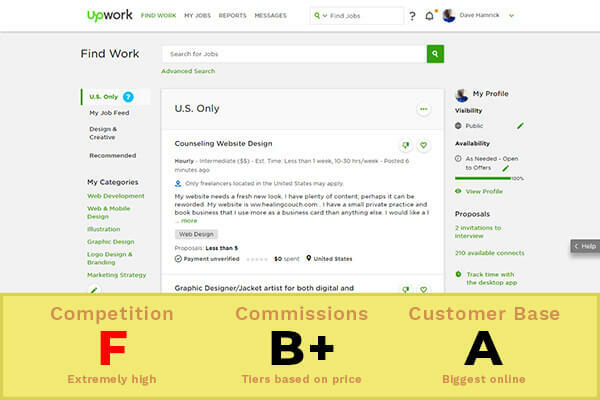 If Fiverr is the spot for quick, simple work, then Upwork is on the other end of the online freelancer job spectrum. While Upwork does offer short term work, many of the job postings on Upwork are geared more towards long-term gigs. One of the best things about Upwork is that instead of the “menu style” selection of gigs like on Jungle Scout Market and Fiverr, Upwork is more of a “job listings board.” Companies post the work they need and freelancers bid on the available work. Like Fiverr, Upwork’s biggest drawback is that it’s very competitive. And although it uses the job listings board method over the menu method, professional freelancers often find themselves bidding against competitors willing to offer their services for very low rates. Freelancers sought: eCommerce experts, Amazon specialists, digital marketing, virtual assistants, web development, website design, customer service, advertising. Freeeup, like Jungle Scout Market, specializes in pre-vetting only the best freelancers. And while Freeeup does offer work for Amazon specialists, it’s open to all forms of eCommerce experts. Another interesting thing about Freeeup is that it doesn’t work like a marketplace like Jungle Scout Market or Fiverr or even Upwork. Instead, both buyers and sellers sign up for Freeeup. Then, when a buyer puts in a request for a certain type of Freelancer, Freeeup introducers the buyer with a seller in 1 business day. Freeeup has a pretty cool system, and rumor has it that the customer service there is great. The only drawback is that its customer traffic is similar to Jungle Scout Market’s, despite being around for two more years than Jungle Scout Market. Freelancers sought: logo designers, packaging designers, brand identity designers, t-shirt designers, book cover designers. If you’re a freelancer looking specifically for graphic design work, then 99 Designs is a great place to look for a gig and one of the best freelance websites around. 99 Designs uses the marketplace dynamic similar to Jungle Scout Market and Fiverr. That way, buyers can view your work first, then make an offer. Despite being a niche site, 99 Designs gets nearly the same volume of traffic as Upwork and Fiverr. This is great for finding work, but also means steeper competition. And unfortunately, 99 Designs doesn’t vett their professionals, so you may find yourself being outbid by low-cost agencies. Best Freelancer Websites – What’s Your Favorite? And that’s our list of the best freelancer websites online. What sites do you use for finding work, jobs, and gigs in 2018? Let us know in the comments below! If you’re talented and want to earn your worth, you gotta try Toptal. The pay is the highest among the freelance platforms, but good luck getting in! Hi Dave, nice article. I noticed you also listed design-related platforms. Perhaps DesignBro would be of interest to your readers – they call themselves ‘the world’s highest quality affordable design service’. Nice list, Dave. I never heard of Free-Up before?! Personally, I think Fiverr is by far the best and most rewarding platform out there. Upwork is good when stuck but Fiverr is more like a shop window and certainly more fun to use.